LionNet, Penn State Health Milton S. Hershey Medical Center’s virtual telestroke program, partners with 16 regional hospitals. 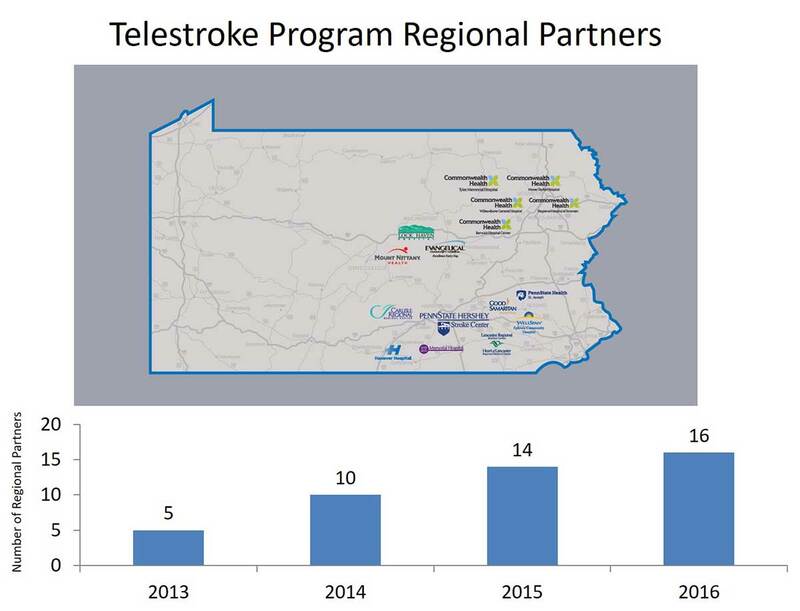 The telestroke network provides stroke patients rapid access to expert stroke neurologists and neurosurgeons, no matter how remote or rural the community hospital. Stroke patients at a partner site emergency department (ED) are assessed in real-time via audio/ video feed by a stroke neurologist or neurosurgeon at Hershey Medical Center; physicians at both sites can share patient imaging, charts, and test results. Since its July 2012 inception, the program has grown exponentially and more than 5,000 patient consults (approximately 2,000 of which were ischemic stroke patients) have now been performed using LionNet. Raymond Reichwein, MD, LionNet program director and co-director of the Penn State Comprehensive Stroke Center notes, “Since 2012, we have seen solid improvements in objective stroke care measures. 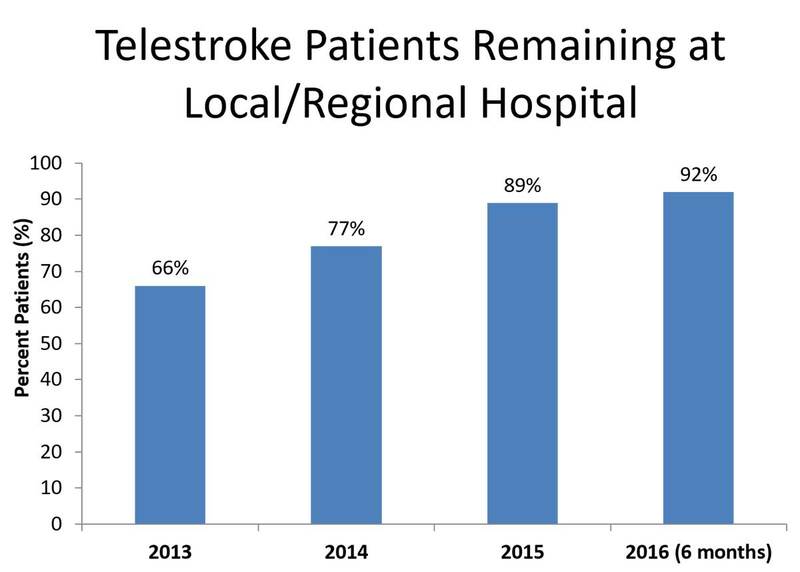 Recently, we achieved a median 68-minute door-to-needle time for intravenous tPA administration in patients with suspected acute ischemic stroke.” The national median door-to-needle time for intravenous tPA is 96 minutes.1 Patients may be arriving at the ED sooner, since several partnered community hospitals are now designated primary stroke centers, avoiding longer transit times to more distant hospitals. More LionNet patients are able to remain at their community hospital for care, rather than being transported to Hershey Medical Center. Dr. Reichwein notes, “Ninety percent of the stroke patients we evaluate stay at the partner community hospital, up from only around 65 percent when the program began.” To systematically study the impact of LionNet on stroke outcomes, Dr. Reichwein and Stroke Center Co-Director Kevin Cockroft, MD, plus Kelly Rotondo DNP, MSN, RN, telestroke program manager and Morgan Boyer, BSN, RN, CNRN, telestroke coordinator, have developed a partner site patient registry and are gathering additional data such as 30- and 90-day post-stroke outcomes, length-of-stay, mortality and the occurrence of major secondary complications for both non-transferred and transferred telestroke patients. RESIDENCY: Neurology, Penn State Health Milton S. Hershey Medical Center, Hershey, Pa.
Fonarow GC, Zhao X, Smith EE, et al. 2014. Door-to-needle times for tissue plasminogen activator administration and clinical outcomes in acute ischemic stroke before and after a quality improvement initiative. JAMA. Apr 23- 30;311(16):1632-40.